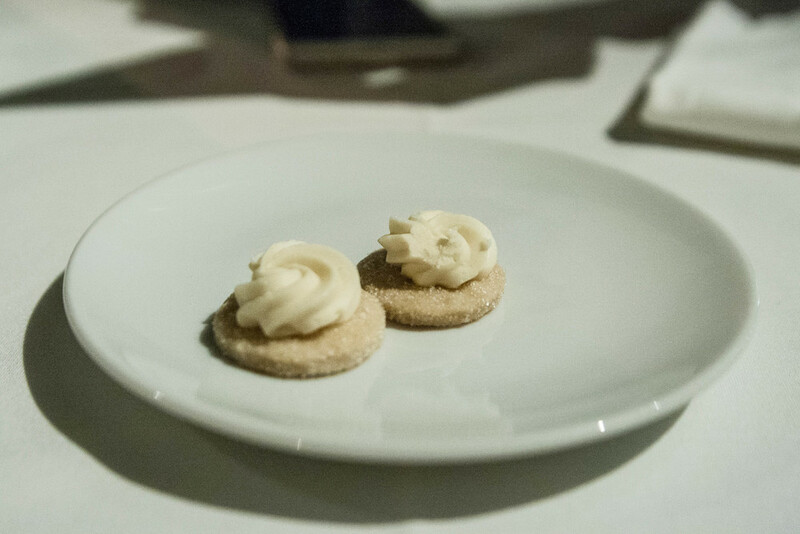 I don't even know where to begin with this post, but I guess I can start by telling you that I'm salivating just at the memory of eating the food at Ancora. Ancora is one of the new kids on the block (it's located where C Restaurant used to be) which specializes in using West Coast ingredients through Peruvian and Japanese techniques and flavours. From the stunning harbourfront view to the glistening crystal chandelier to the lovely service and exceptional food, Ancora is a gem that I almost want to keep to myself. I heard from one of the managers during my meal that things didn't start out smooth when they opened six weeks ago - in fact a few weeks into opening, the restaurant had to make some pretty big changes. Whatever they did during that time, they did it well. Like REALLY well. + If you're going to serve bread, make it good - I mean it stills counts as part of the customer's whole dining experience. Oh, and any restaurant that gives unlimited focaccia bread and butter that isn't rock hard already gets a thumbs-up in my book. On another note, I'd like to point something out that really bothers me sometimes. 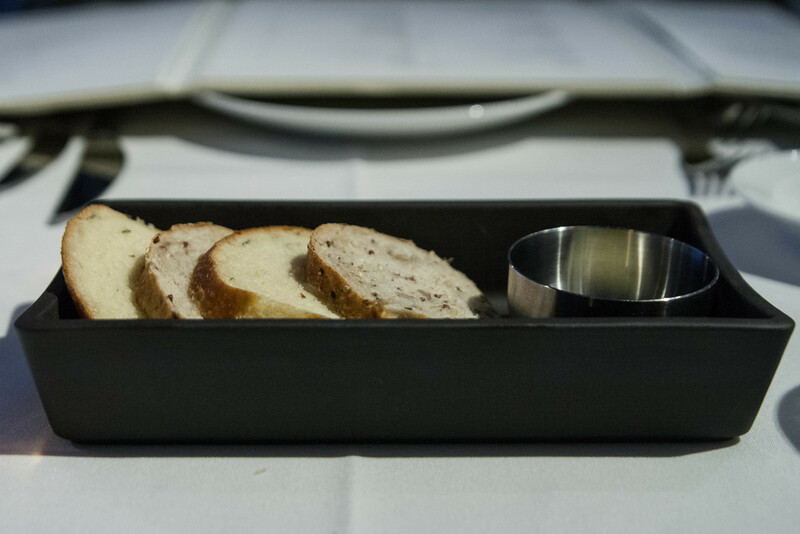 A lot of restaurants offer complimentary bread and when you ask for more, the server will pretty much judge you for being cheap and it just gives off a really unprofessional vibe for the whole experience. Of course don't go ordering one appetizer and expect to get your money's worth by loading up on free bread, but I really think that if you order a reasonable amount of food, wanting more complimentary bread shouldn't result in a shame-fest. So what I'm trying to get at is - thanks, Ancora, for not being judgemental when I wanted more focaccia. 5/5 - I'm a fan of rose when I eat out so it was to no surprise that I jumped to the only rose by glass on the wine menu. In addition to having it recommended by our server, the restaurant sommelier also gave us the thumbs up for this wine. Unlike many of the roses offered by the glass, this one finishes more on the fruity side and is light and sweet with hints of floral. And I love it. This wine is from Sea Star Estate Farm and Vineyards on Pender Island and the Pinot Noir Rose is apparently so popular that it's sold out in every liquor store in the lower mainland and only available in limited quantities to specific restaurants (like Ancora). So if anyone sees this in stores, LET ME KNOW BECAUSE I WANT TWO CASES. 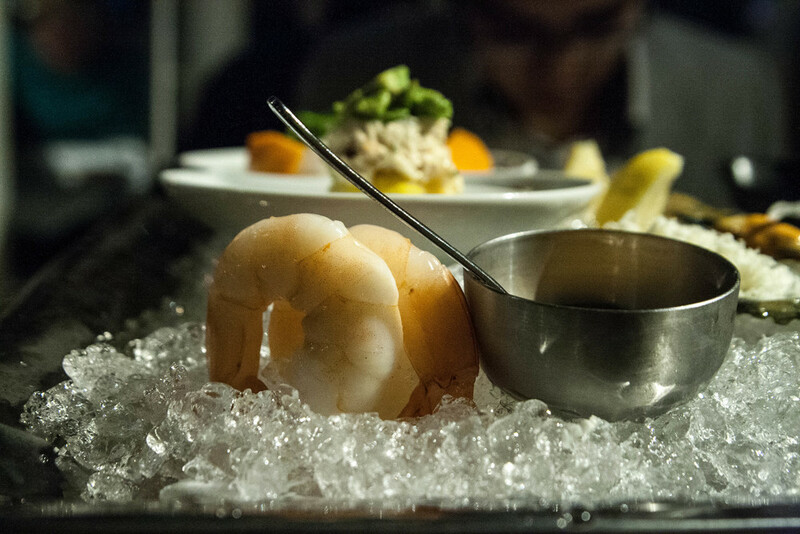 5/5 - The Ancora Glacier is one of Ancora's most popular dishes and it's easy to see why. 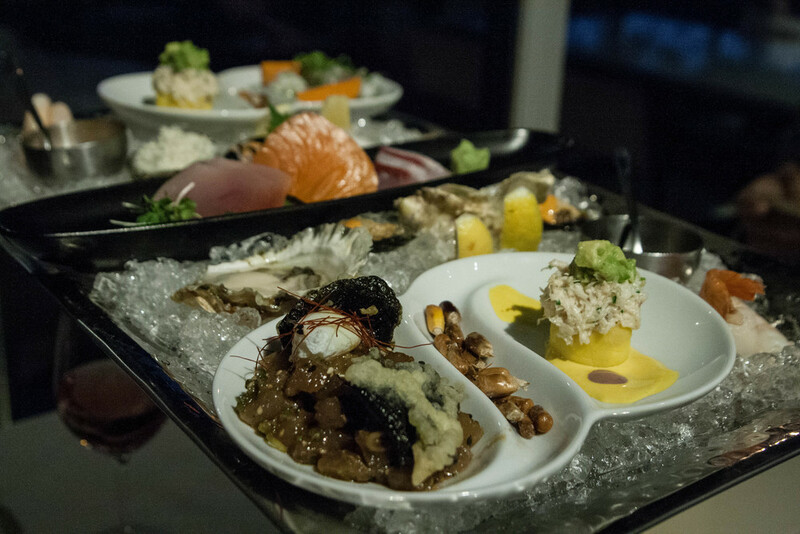 From the beautiful array of seafood to the presentation of the massive platter, the whole experience is a lovely way to be introduced to what Ancora prides itself in. Ceviche tasting: Not too acidic but still flavourful and definitely generous with the portions of seafood. Tartare tasting: Lovely flavours with a generous amount of chopped fish. I particularly liked how the seaweed chip wasn't soggy and not too salty. Crab causa: This was apparently a traditional Peruvian dish which I found to be fun yet tasty. The yellow mashed potato and crab mixture was creamy and nicely paired with avocados on top. Salt Spring Island mussel Peruvian escabeche: Fresh yet no trace of fishy-ness. The sauce on top makes for a nice splash of spice. Oysters: Very fresh and not too slimy. Poached prawns: Large, juicy prawns and although cooked, the poaching helps to keep the freshness of it. Sashimi: There was albacore tuna, yellowtail, and atlantic salmon - all fresh, well cut, firm yet soft, and deeply flavourful. I associate this as being an extended and better version of Blue Water's Seafood Tasting Platter. I found that all the seafood used was much fresher and I found that serving everything on a plate of ice helped to retain the crisp flavours. 4.75/5 - And here I am again, lucky enough to have bluefin tuna on the seasonal menu. These give glistening strips of tuna are absolutely mouthwatering and although kept cold, still melt in your mouth. I didn't even need to chew to devour it all. I do find that Japanese imported bluefin tuna differs from Nova Scotia farmed bluefin (which is more sustainable) the most on texture - this one was a tad tougher and overall more firm. 4.75/5 - One particular thing I really like about Ancora is that they can offer to split a dish for you - like ACTUALLY split it onto two plates. Not only is this great for preserving the presentation of the food, but I found that as a whole, they give you more food than if you order it all on one plate. The lobster is insanely juicy and lightly flavoured with the risotto sauce. Plus, for an appetizer, there is a surprisingly generous amount of lobster. One thing I will say is that I would've liked the rice to be cooked a bit more. 4.5/5 - Meat AND seafood in one dish? Sign me up. I loved how such a small plate had so much texture and flavour. The scallops were seared (a bit too much in my opinion) on top while keeping the inside smooth. I really liked the fatness of the pork belly which went well with the crispy on top. Overall a nice dish but I would've preferred a different broth. 5/5 - I was a bit skeptical of ordering more seafood, but oh am I glad I didn't pass on this dish which was also recommended to us by our server. This dish is a perfect end-of-summer-beginning-of-autumn dish as the flavours are simple, clean, and fresh while also showcasing a beautiful cut of fish. Yellowfin itself has a distinct flavour when fresh and I was glad that although it was seared, the flavour was still prominent in the middle of the meat. The veggies and sauce on the side added a splash of colour and simple flavours that complimented the fish centerpiece. 5/5 - I'm still debating on whether my favourite dish of the night was the yellowfin or this one. The beef tenderloin was surprisingly soft and like the yellowfin, melted in my mouth. Also, I'm not sure if Ancora's knives are really good or if the meat was just THAT soft, but I barely had to use any force to cut the beef. 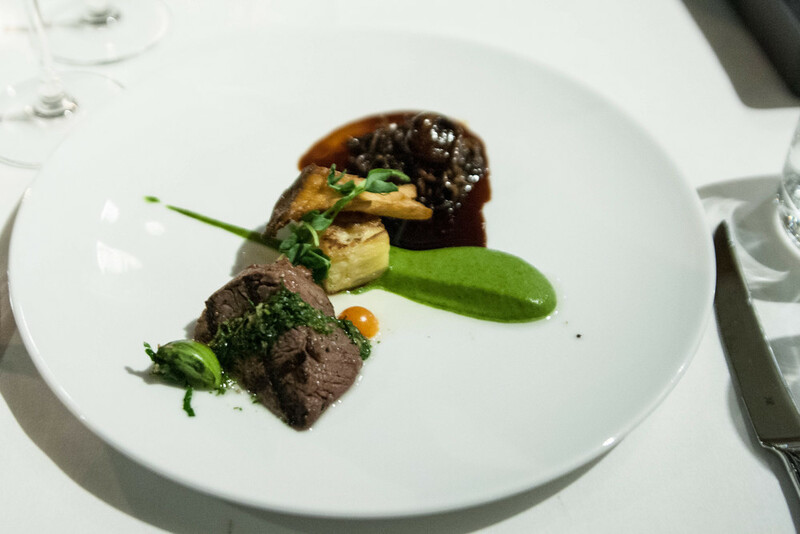 I would've liked if the short rib was softer but I liked it paired with the veal reduction for some added flavour. The potato/Spanish omelette was creamy and the oyster mushroom somehow tasted like meat as well - I loved it all. 5/5 - Dessert, dessert, dessert, how could I say no. We were celebrating J's birthday so I asked the server if he could find a candle to spruce things up and it surprisingly looks pretty cute. The dessert itself is lovely and not overly sweet. The white peach sorbet with the bits of grapefruit and fruit gel add to the freshness which contrasts with the melty goodness of the white chocolate. So I think you can all tell that I was impressed with my experience at Ancora. In fact, I think it might have made it onto my top 5 restaurants in the city. Beyond the food (which is delicious), there are so many things that Ancora does right - their service most importantly. Our server, Richard, was friendly, professional, and funny. But most importantly, he treated us with a genuinely positive attitude. I can't emphasize how important it is, especially at a high-end restaurant, to serve someone well not just because it's part of customer service, but because you actually want to give someone a good experience. He recommended us great food, offered to take pictures for us, and always made sure to check with us on our food and drinks without being too excessive. What stuck with me the most is when he eagerly waved to us through the window of the restaurant when we were leaving - it just goes to show that the customer's experience doesn't end until they've left the restaurant, not when they've left the table. On top of service, I liked how although the restaurant is high-class, the atmosphere is still inviting and friendly. Ancora has the whole package, the decor, the view, the food, and the service - a gem for sure. If you're looking for something nice that's worth every penny, Ancora really is the place to be.